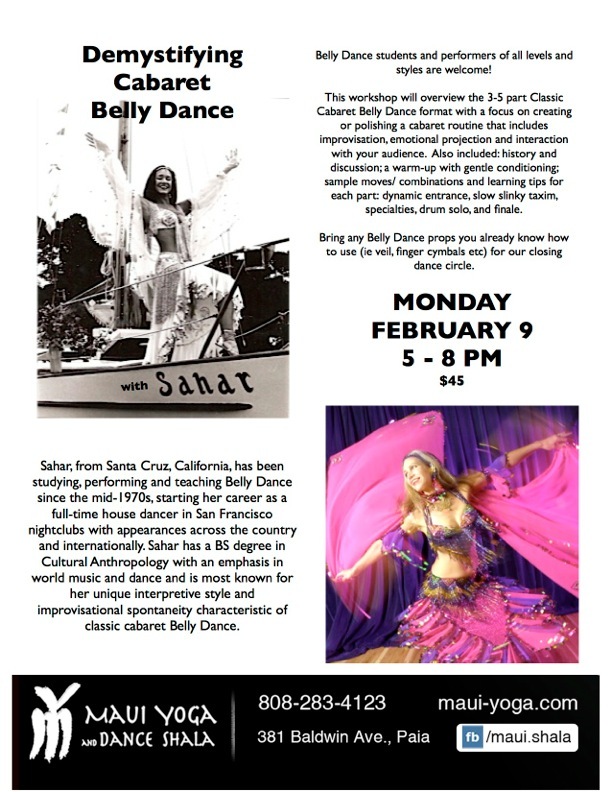 Belly Dance students and performers of all levels and styles are invited to join renowned Belly Dance artist & dance educator, Sahar in a playful workshop on the beautiful island of Maui, Hawaii: Demystifying Cabaret Belly Dance. This workshop will overview the 3-5 part Classic Cabaret Belly Dance format with a focus on creating or polishing a cabaret routine that includes improvisation, emotional projection and interaction with your audience. Also including some history & discussion; a warm-up with gentle conditioning; sample moves/ combinations & learning tips for each part: Dynamic entrance, Slow slinky taxim, Specialties, Drum solo & Finale. Dress comfortably in leggings/sport top or loose-fitting clothes with dance shoes if you have them or non-slippery socks and bring a hip scarf, water bottle & any Belly Dance props you already know how to use (ie veil, finger cymbals etc) for our closing dance circle. Please see class page for 2015 schedule.